We walked down the street, my left hand braced by he’s right as the feeling of security was certain to me. I would content myself with allowing him to lead as I followed, not necessarily knowing where we were heading to or why we moved that direction. He would tell me things and I would listen, many times not even knowing what he was talking about, but I’d listen anyways. Some of the best times I can ever remember in my few years spent so far in life are times spent with him, strolling, in the farm and in church. It feels just like yesterday, it’s been nineteen years since he departed this life on earth and I miss him. You can imagine how young I was then (yea, you are free to imagine…lol), but I still feel the impact of his fatherly love on me now. He was really a great man and a wonderful dad. I didn’t have the time to have celebrated him on a day like this when he was on earth, but right now even as he is with the Angels and Saints in the heavens I celebrate him. 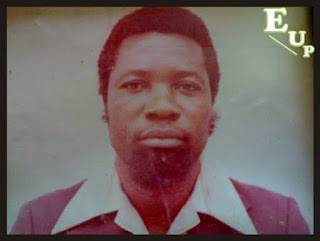 “CELESTINE N. EGWUMBA” I bless God for making you the man whom he gave the responsibility of bringing me to life. As you smile at me from the heavens, I can only tell you “I Love you”. Be sure that I will hold on to the virtues and the faith you introduced to me and most importantly, after my life on earth I will join you in the company of the Saints and Angels to stand in the Lords presence, raising our voices to worship him for ever and ever… Amen. Happy Father’s Day to all the fathers here on blogsvile. It seems a sad 1 but d truth is dat he has journed forth 2 pave d way. Water d land, n make tinz better 4 u. Never regret I say 2 u solemnly my broda 4 he made d vry best out of his shopin on earth. Now he pass d batten 2 u young Egwumbus so dat u run 2 d finish. Do make d best out of it. B strong bro.surely it shall all end in glory. To all men out dia, it's easy 2 b a fada Bt trust me, it's nt easy 2 b a dad. All tnks 2 my dad 4 who I am 2day. U ar sometimes stubborn, aggressive, n annoying. Bt Dats ur little way of showing luv m protection Jst lyk d hen 2 her chicks. In d midst of changes n chances, I luv u so much n I promise u shall rip d fruits of ur labor. Happy father's day 2 u all. From ur boi Dramzzy (Mr. White). God bless y'all. You make him proud, I know this because I know you. I see his legacies in your kindness, your intelligence, your genuine love for others and in the way you love your mum. May he continued to rest in perfect peace. Awwww...happy father's day to your dad and all the dad's in heaven. May his soul continue to rest in God's peace. Amen. May his SOUL continue to REST with GOD almighty... Amen..
Awww. may his soul continue to rest in perfect peace. I can't imagine how much you miss him. We know deep down that life is short, and that death will happen to all of us eventually. It is important to live and leave life inside the heart of others. Your dad did. May his soul rest.